A very well-written Star Trek novel, set after the events of the movie Nemesis and putting Will Riker in the captain's seat for the first time on his own ship. 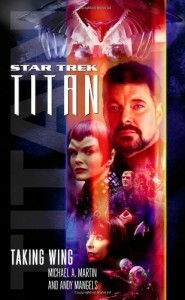 The Titan is a ship with the most racially diverse crew in Starfleet history, and set to explore uncharted space. Instead, it gets drawn into a diplomatic intrigue between the Romulans and Remans. Guest-stars include characters from Voyager, other novels, and even the original Trek series. Highly recommended!